Leveraging the pre-existing power of CRISPR, a team of researchers has made an important adjustment to the groundbreaking gene-editing tool that could make it precise enough for human applications. Researchers from Harvard University have modified the CRISPR system such that it can now alter individual DNA letters in a given gene. This new technique, called base editing, is poised to have a big impact and will likely lead to improved models for human disease and more intricate modifications of animals and plants. What's more, it's poised to increase the accuracy of human genome editing, which could make CRISPR more palatable for those worried about "off target" mutations; the system has been used on human embryos, but it produced far too many unintended mutations for scientists' liking. 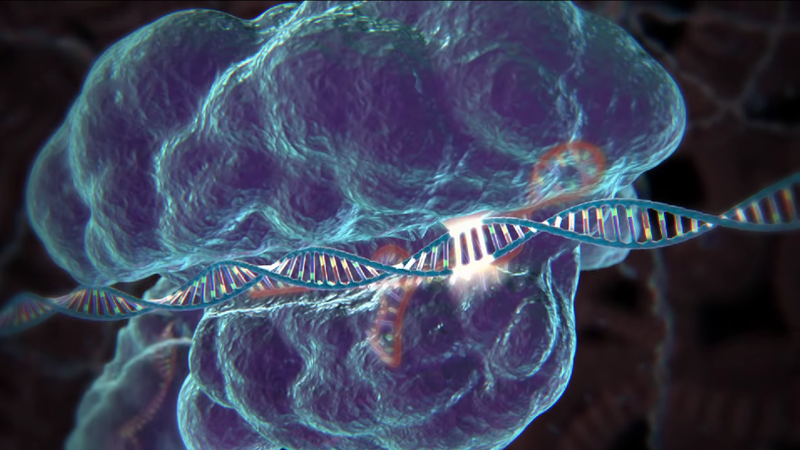 As the name implies, the CRISPR/cas9 gene editing systems consists of two parts. CRISPR is a strand of RNA that hunts for specific sequences of letters in a cell's DNA sequence (like a mutant gene that causes a genetic disorder, for instance). Once this string of letters has been identified, an enzyme — typically cas9 — chops the DNA at the desired point, removing the problematic sequence. Typically, researchers will introduce a new piece of DNA to fill in the gap, and they exploit the cell's built-in self-repair mechanism to do it. Unfortunately, this last step can often result in problems, since cas9 is a very blunt tool. Sometimes, the cell won't grab the newly introduced piece of DNA and will instead haphazardly patch together the severed ends of the double helix. This process often results in the deletion of genetic information (which is bad) and can even introduce new bases at the site of the break (also bad). The end result is an unwanted mutation. Or two. They disabled the Cas9 enzyme so that it would no longer cut DNA, then tethered it to an enzyme capable of chemically converting one DNA letter to another: a cytosine ('C') to a uridine ('U'). Uridines are usually found in RNA rather than DNA; in DNA, the cell reads them as if they were the 'T' base, thymidine. A guide RNA would direct the disabled Cas9 to its target in the genome, where the modified enzyme would change the DNA sequence rather than break the helix. So the Harvard team's modified CRISPR system is less a "cut and paste" tool and more like a true editing system. They're literally editing the genome on the fly — and they have got it down to the level of individual letters. At this point it can only make two types of changes in DNA (either a C to U, or a G to A), but the researchers are hoping to broaden its scope. To prove its effectiveness, the researchers used the base-editing system to correct variants associated with Alzheimer's disease and breast cancer. In a test tube, their engineered enzyme worked about 44 per cent of the time. However, this figure dropped to a disappointing 7.7 per cent when applied to live cells. It appears that this new enzyme often makes changes to only one strand of DNA, creating a mismatch with the other strand. When the cell corrects this mismatch, it reverses the work done by the enzyme. It's a problem that will obviously have to be fixed, but the researchers are confident it's not a deal breaker. Accordingly, the scientists cautioned that the base-editing system is still years away from helping people with genetic disorders. But as this new research shows, we're getting considerably closer.